Pierre: “I took the liberty of reading the information that came enclosed with your new paracord leash. Did you know that paracord is rated for 550 pounds? Gramma could walk an elephant on that leash! She should certainly be able to handle you with it. Plus, it is mold and mildew resistant, so if it gets wet, no troubles! 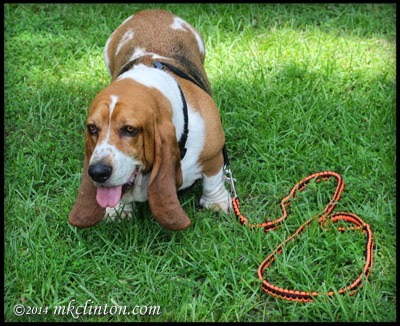 Bentley: “My leash came with a super strong Nickel Plated Metal Swivel Snap Bolt Clip. There is no way that I’ll be able to pull loose if I want to chase some crazed squirrel. *sigh I guess that’s probably for the best. You know how I get when I pick up a scent trail. 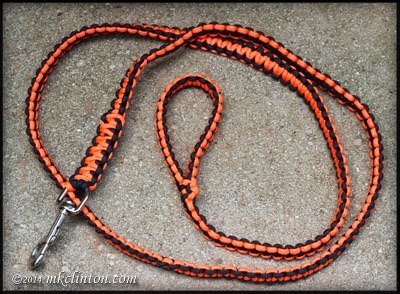 Disclaimer: We received one Rand Hill Paracord leash in exchange for our honest review. There was no monetary compensation. Barking from the Bayou only reviews products that we believe in and want to share with our audience. All opinions expressed are our own. Contest extended!! Enter for your chance to win two bags of Natural Balance L.I.T. Dog Treats. We are joining our friends Ruckus the Eskie and Love is being owned by a Husky for another Thoughtless Thursday blog hop. Be sure to visit them and these other thoughtless bloggers. Paracord seems to be the new trend in collars and leashes. Mom likes to have me with red, but orange is also a good color on me. Happy walking! Looking very dapper Bentley and you are so right all the doglets will swoon when they see you. Have a tremendous Thursday. THAT is super. Glad that you like it. That is a super looking leash, kinda out does the ones I do, I have to get practicing ;) It is a fabulous color and the fund raiser bit is great. Thank you for sharing about this company. What a cool leash! Using them for fundraisers is a great idea! That is one COOL leash! Is it my favorite color....orange?!? Just remember, no jumping off anything higher than the sofa, pals! Very creative way to have a conversation and share information at the same time! Thanks for sharing on TT! Pretty snazzy new leash Bentley!!! Wow! Love the colors! Loved your review! Those leashes look great! I am always on the hunt for sturdy equipment for my little Houdini, Ruby. What a great leash! I have to learn to like walks…Maybe with a leash like that, I would! We just got our first paracord collar and leash and we love it! It would be great to have another source for them, since I can definitely see us getting more now. I have read about these!! Maybe I will try one now ! Thanks!! Nice colors on those leashes. Being an avid knot tier myself I am aware of the amount of time and energy it takes to make on of those and have it look good in the end. Rand Hill's looks like the do good work.